There are some gadgets that are so stylish and leading-edge that people will literally accost strangers in the street in an effort to take a closer look. 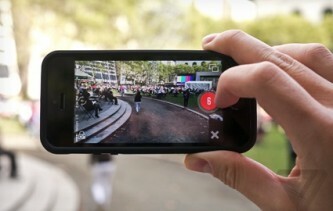 The original iPhone was one; the MacBook Air was another; and even the $130 Flip Video camcorder was a showstopper when it first made its debut back in 2006. 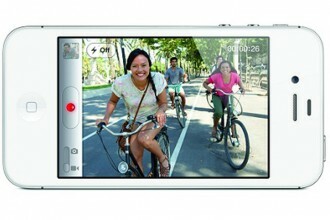 Those three iconic gadgets and others like them have now been joined by another scene-stealer – the Samsung Galaxy Camera. Virtually every time I use the Galaxy Camera to take a quick photo or shoot some video, I am interrupted by gadget geeks young and old clamoring for a better look at this remarkable device. Whether it’s the Samsung name, the attractive styling, or the device’s unique functionality, everyone appears to be enthralled by this latest addition to the increasingly popular Galaxy family. Thankfully, this is also a device that lives up to the extraordinary hype. I don’t consider myself an accomplished photographer but the Samsung Galaxy makes me feel like one, taking complex functions and relabeling them in terms that are easy to understand and even easier to use. Here’s an example: We all know that taking pictures of fireworks at night is not easy; you need to eliminate flash, increase the exposure, and keep a steady hand. But instead of making you search through numerous different functions and experiment with various settings, the Galaxy Camera instead gives you a ‘smart’ setting simply called Fireworks. And that’s all you need! Once you select Fireworks, you can start shooting right away. There are 15 smart settings in total, including Macro, Panorama, Silhouette, Sunset, and my own personal favorite, Beauty Face. (‘Corrects facial imperfections automatically when taking portrait pictures.’) Each smart setting comes with a short on-screen explanation, telling you exactly what the camera is doing so you have confidence in your shot. Of course, if you want to experiment with your own settings, you can do that through Expert mode, which gives you access to ISO values, EV settings, shutter speeds and all the other good stuff that amateurs can find a little intimidating. 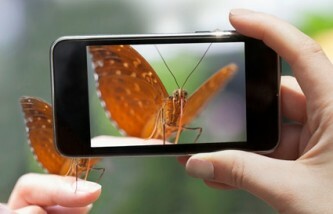 But it’s not just the camera that makes the Samsung Galaxy so special. Perhaps my favorite moments are when people stop to ask about the camera and find that I’m checking e-mail, watching a YouTube video, or even Skyping with my friends. All this is courtesy of the built-in Wi-Fi or Verizon’s lightning-fast 4G LTE network. The Samsung Galaxy comes with a full suite of apps, and the Google Play store gives you access to thousands more. 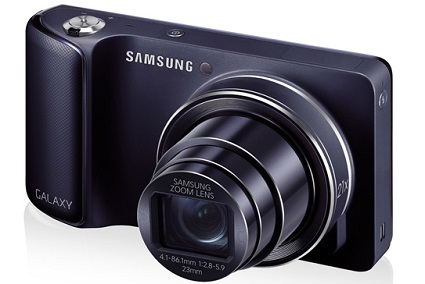 The Samsung Galaxy Camera is an amazing device, a fully-fledged camera that thinks it’s a smartphone and so much more! These kind of pioneering devices only come along once in a while. If you see me using it, come on over and take a closer look!